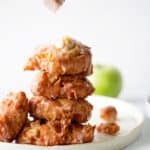 BEST Apple Fritters Recipe – Pieces of delicious Granny Smith apples wrapped and fried in sugary dough will send your taste buds into food heaven! The best apple fritters you’ll ever eat. I have never been a big fan of apples. Most people think I’m crazy but I just don’t get what the hype is about them. I’ve tried them all (Honey Crisp, Granny Smith, Red Delicious, etc.) and I’m just not a fan. My husband’s family takes an annual road trip up to Michigan every autumn to go apple picking. This has become my annual autumn tradition, as well, and when we come back home we have bags and bags full of different types of apples. I decided to try this apple fritters recipe just out of necessity to put all those apples to good use. I desperately wanted to be a fan of apples. Constantly seeing delectable photographs of autumn favorites like apple pies, apple tarts, and apple crisps make me a jealous gal around this time of year. When I saw apple fritters on an episode of “Cook’s Country,” I knew this might be the recipe to adapt to help me fall in love with apples because I was literally drooling and because Cooks Country recipes are always terrific. I always trust America’s Test Kitchen recipes and these Cook’s Country apple fritters looked amazing. I must say I really “liked” them! My “like” would transform into “love” if I could replace the apples with another fruit. I think I am a hopeless cause. However, I did have apple fans try them, and they loved them. They are super easy to make and a great fall recipe. Making apple fritters all starts with what type of apple you choose. 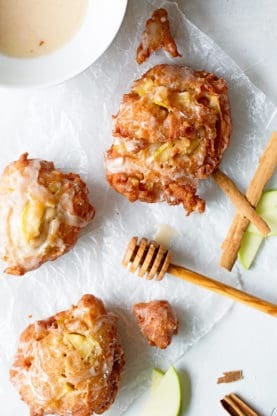 This recipe calls for the Granny Smith apple variety to be used because they are not very sweet and if you use a super sweet apple, then the fritters will be too sweet. Peel, core and cut your apples in 1/4 – inch pieces and add them to your combined dry ingredients. You want to make sure that the apple pieces are small enough to get tender when they are fried in each and every bite. To make these, you simply combine wet and dry ingredients. 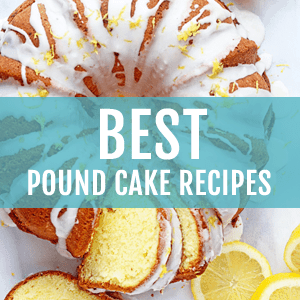 The dry ingredients are similar to those in a cake recipe. Flour, sugar and leavening along with a few spices that always help apples shine (like cinnamon and nutmeg) make up the dry ingredients. The wet ingredients include eggs, melted butter and vanilla which gives great flavor and apple cider, which is my favorite wet ingredient in this bunch. It really helps amp up the wonderful apple flavor in each and every bite. These are fried fritters so you get such a wonderful crunchy exterior with a tender doughy inside. The two textures are wonderful together. If you love fried doughnuts, you will love these. You will need to make sure your oil temperature is between 325 and 350 degrees, until they are fried to deep golden brown, 2 to 3 minutes per side. Lastly there is a wonderful and super easy glaze that is amazing on these fritters. 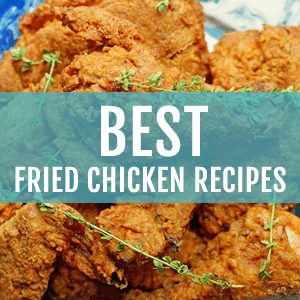 You can whip it up and then spoon it over the fresh fried fritters at the end. It sets and becomes just wonderful. This Spiced Cider Apple Cake recipe is a fall favorite. Seriously Apple cider has never tasted so good! This Caramel Apple Cheesecake recipe is seriously unbelievably addictive! 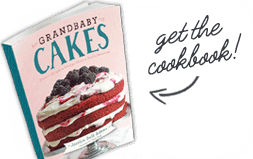 It is a fall baking must! Simple baking can’t get any easier than these Baked Crumble Apples! Butterscotch and apples are a match made in heaven in these Butterscotch Apple Bars! If you love apple fritters, you’ll really get a kick out of my peach fritters! Also, if you love fried dough, you’ll fall in love with all my funnel cake recipes (classic, red velvet, strawberry shortcake and swirled vanilla chocolate). 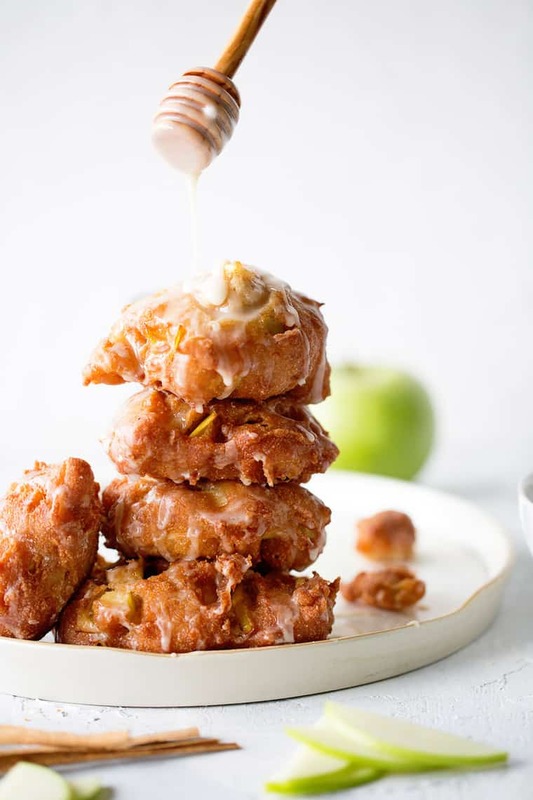 Apple Fritters Recipe - Pieces of delicious Granny Smith apples wrapped and fried in sugary dough will send your taste buds into food heaven! The best apple fritters you'll ever eat. Add all dry ingredients (flour, granulated sugar, baking powder, salt, cinnamon, and nutmeg) in a large bowl and whisk to combine. Stir in apples. Next add wet ingredients (cider, eggs, melted butter, and vanilla extract) to a separate bowl and whisk together then pour mixture into dry ingredients and whisk until combined. Heat 3 cups of vegetable oil in dutch oven over medium-high heat to about 350 degrees. Use 1/3-cup measure to transfer 5 heaping portions of batter into the hot oil. Press batter lightly with the back of spoon to flatten somewhat. Fry until golden brown (about 2 to 3 minutes each side). Once all fritters are fried, remove fritters and transfer fritters to wire rack set inside rimmed baking sheet or to a paper towel to dry. Bring oil back to 350 degrees and repeat with remaining batter. Let fritters cool 5 minutes. Whisk together confectioners’ sugar, cider, cinnamon, and nutmeg in medium bowl until smooth. Spoon over fritters and let set for 10 minutes then serve. These would pair great with a cup of coffee! I need to make them! OH MY!! These look incredible! Love apple fritters! This is such a great idea!! I LOVE it!! 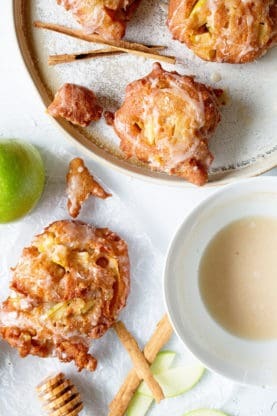 I love apple fritters and this is a must try, so delicious! Wow, your pictures are mouth-watering! I originally found this recipe when I signed up for a free two week trial subscription to http://www.cookscountry.com, and just made these today….just wanted to vouch that these are AMAZING!!!!!!!! I admire that you gave it a try despite not digging apples; hey, at least you know what flavors you like and don’t 🙂 I do love apple desserts and this one was particularly wonderful. Thanks so much Sonya! They are really yummy indeed! Wow very testy fitters….would love to make it soon on t time. 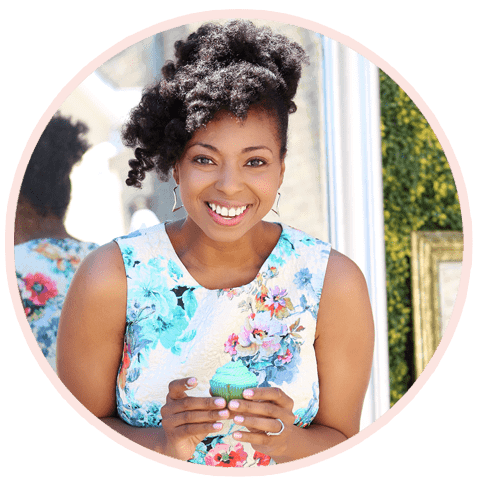 Have you ever tried an apple picked from a tree? They’re super crunchy and juicy. 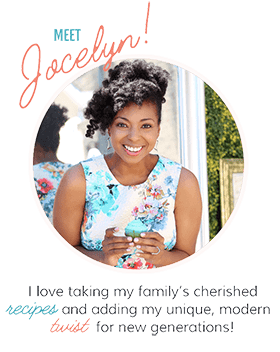 I grew up on an orchard and for years couldn’t eat an apple bought in a store. These apple fitters look so decedent. Will have to try them for sure! Kristen you are so right!! The best apples are when ripe off the tree if not bought in stores early in Fall after that they lose their taste and all taste much the same. When using them for baking their flavor seems to revive. Also living in parts where only apples and oranges are available we don’t have much choice. when it comes to baking with fruit apples are the best!! How dare you disrespect apples in this manner? One of my favorite fruits and so versstile. This is one of my favorite ways to use them too. Can’t believe you’re not into apples! Oh man. They are so good in desserts. These would be great with a bit of fresh cream. So good. I am a huge apple fan and these look fabulous! Nothing like grandma’s inspiration. I totally am with you, I don’t like eating apples BUT I am a huge fan of apple desserts…weird I know. I would definitely gobble this up!